Prisms are available for measurement in liquid or in air. They are mounted to holder for easy exchange. One surface is mirrored. Price on request. The dimensions are 20 x 20 mm, the total thickness is 1 mm. The glass slides are coated on the top by a very thin homogeneous layer of gold. This gold coated glass sides can be used for various applications like SERS, AFM, STM, SEM, FT-IR or for any other surface chemistry related technique. One package contains 60 slides. Price on request. The cells are made from transparent plastics, compatible for measurement with biological samples, stable in aquaeous solutions in the range of pH 3 to 11. The cells have two channels, with inlet and outlet connected to silicon tubes. 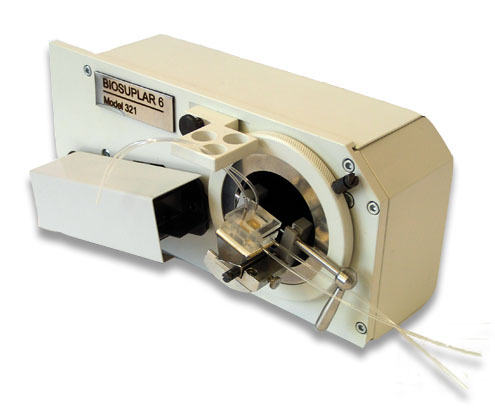 Special cells with electrode contact are available. Price on request. Our consumables are developed and optimized for getting best results with the Biosuplar devices. If you need any special support please contact us.